Women of all shapes will appreciate our Modern Stretch Cotton Collection. With an updated fit and figure-flattering details, the extra soft cotton is combined with a dash of spandex to retain shape - and make the most of yours. We have added extra length throughout the body for styles that move with you for exceptional comfort all day long. 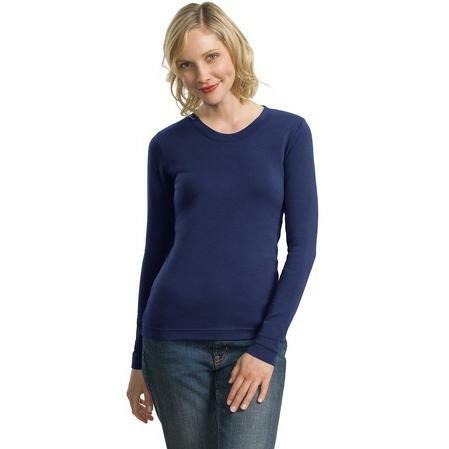 Our scoop neck has long sleeves for coverage and warmth when the weather looks iffy. Made of 6. 5-ounce, 96/4 cotton/spandex stretch fabric in a 1x1 rib knit construction. Embroidery will be added to left chest.